So I've made the official decision to make my Weekly Reviews on Wednesdays from here on, it's just more convenient of a time for me to write about my week. I've decided to start a weekly column based on reader questions, which I will come out with every Friday. I'm not sure that I'll have enough questions to start it this week, but if you would like to submit a question for this (possibly next) Friday, or just read more about it, check out this page for more info! This week my gold total raised to 1,668,254g, an increase of about 159,000g. This is great, I love my earned numbers for this week, but I really was hoping to invest a bit more before 5.2 came along. On the other hand I have about 350 stacks of Ghost Iron Ore I want to prospect before 5.2 drops so I have plenty of stock on that front. I spent a lot the previous 2 weeks because I had a supplier who was cutting me a nice deal on ore and herbs, but he seems to have become disinterested in farming. I am currently looking into a new supplier, but my server is pretty small, so I don't know if I will be able to find one. Yesterday I got my Blacksmith (Blood DK) to level 90, so I could take advantage of the New BS CD when it becomes available. I was able to get enough rep with the Klaxxi from 89-90 to not have to grind them for BS patterns at all. Today, I was already revered with the Tillers and able to start planting Songbell Seeds for Spirit of Harmony. I'll be going over this more in depth in my Tillers farming post I'm writing tomorrow for Cold's Blogging Carnival for March, I don't want to ruin the surprise! Once I have a decent foothold of patterns, I'll start using the SoH for crafting, haven't done the math yet, but I think my farm plots will be best used in this way, I'll definitely update you once I figure it out. Should easily be exalted by the week's end. My best sale this week comes from my second server, where I had been leveling Alchemy. I had a stack of Bruiseweed, and was missing the other mat, and since there was none on the AH, I decided to post it for 1k just for kicks. I came back 2 days later, with this in my mailbox. Happily surprised! 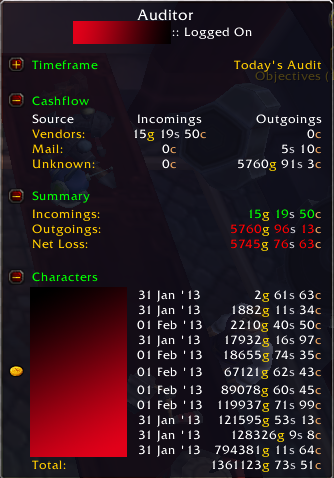 So my week in WoW gold making was good from an income perspective, and finally getting my Blood DK to 90. How did your week go? Lets spread some blog love - which are your 'must read' or 'go to' gold blogs or even other places you go for information & reading matter? First of all a shout out to Nev from Auction House Addict for creating her own version of the 20 Days of WoW, and inspiring some great gold content, and providing it constantly herself. This was one of the most enjoyable things I've done on the blog, so thanks to Nev for the great idea! I'm going to keep this section brief, because these are names we all know and love, and I want this post to focus on some up and coming bloggers. The following two are my favorites to read (after Nev of course), but this list is by no means exhaustive. Be sure to check out my Blogroll in my sidebar for the full list. The Golden Crusade - Eric (aka Xsinthis) is probably one of my favorite gold making writers out there. I see his approach very closely mirroring mine, we're both very mathematical and opinionated, and I really like his writing style. Cold's Gold Factory - Cold has been writing about gold making for almost as long as I've been playing WoW. He knows the ins and outs, co-hosts the Eviscerated Podcast and I love his monthly gold blogging carnivals that I frequently participate in (when I remember to write the post!). There are two new faces on the gold blogging scene that I wanted to give shout outs to, and I really hope you check out their blogs as they continue to grow! WowProfitz - Profitz is new to the gold making scene, but he's already putting out some stellar content. His blog and podcast can be found at WoWProfitz.com, and his livestream can be found at twitch.tv/wowprofitz. I really like the way that Profitz writes, and his podcast has been a great listen thusfar (on his 3rd episode, check it out!). He's a really great guy, and he is using his talents to deliver top notch content to his readers, a great new addition to the gold making community! ZeroHour's Nameless Blog - Zerohour is a well known and established gold maker from the Consortium Forums who just recently decided to make an "Anti-Gold Blogging Blog". I think it's a bit ironic that he gives out gold making tips on what he calls an "anti-gold blogging blog", but I digress. He's a really intelligent guy, and he likes to write about the more in-depth topics and theories in World of Warcraft gold making. I always love reading what he comes out with, and he really does bring a unique perspective to the gold blogging scene, which I think is excellent. What I think is great about the community is all the different perspectives that you get from the different blogs out there. Everyone has a different way of doing things, and molding your own methods around those of other well established players will make you just that more effective! Any gold bloggers (or your own blog) you want to give a shout out to? Leave a link in the comments section! This is probably the easiest concept in gold making, yet so few in WoW have really mastered it. When players on my server realize how much gold I have, they always ask why I don't buy some cool looking mount or tons of TCG items etc. I only buy things (generally) that will get me more gold, which is the best way to make gold. It's just like real life, you invest into profitable things, make good returns, and you gain gold. Don't waste a ton of gold gemming your LFR gear, when you only have a few thousand. Focus on a few markets, get into them, and learn them. The only true way you can master a method is by getting your hands dirty. Even if you only spend 15 minutes of your play time each day doing this, you will learn the markets, and make gold. If you want to unlock true gold making potential, don't just try to flip things or sell the cloth you get from doing dungeons, get maxed professions on all the characters that you can. If you have characters that are 80-89, and won't be 90 any time soon, don't get them LW, BS, Enchanting, or Tailoring. Those 3 need a lot of SoH or reputations to fully maximize, get them on a main instead. The more professions you have, the more cooldowns you have, the more diversifying you can do, the more sales you will make, the more gold you will have. People are often hesitant when they don't see instant profits from their work. Don't expect a million gold by tomorrow if you're just starting out. Set goals and hit them. Pets - Did you used to do the Vendor pet sales? How have pet battles changed things for you? Going into MoP I had some big hopes for battle pets. 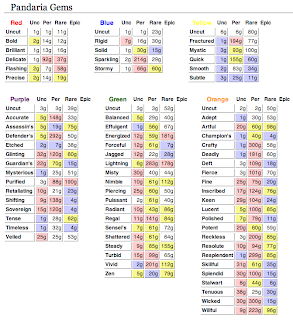 With the stats of rare battle pets being higher than regular battle pets, and only a small purchasable amount of them, I figured they'd be shoo-ins for gold making. That did not turn out to be the case. As far as making a profit with battle pets, there are some pets I could farm and make decent returns with constantly, but as many know I'm not the farming type. Believe it or not, I'm still able to sell vendor pets for a decent markup. Players just generally aren't using Wowhead to find out where they come from, and on my relatively small server, there isn't much competition. The one advantage with the rare battle pets that I'm starting to see that wasn't there previously, is the ability to move capital across servers. If I have 20k gold on server X, and I want to move it to server Y, battle pets are a (sometimes slow selling) way to do it. I have a level 25 pet on my team, so I can learn and recage level 25 pets, which is what I aim for when flipping pets. Also if you're starting out on a new server, I have never had trouble selling Tiny Shale Spider on a new server within my first posting for 500g-1,000g (note that all my "new" servers are usually high pop). They're a great way to gain some starting capital and easily farmable by any character that played through Deepholm in Cataclysm. This week I got selected for the Second Round of the TradeSkillMaster Theme Contest. Voting is currently in progress, and when you vote you will be entered to win one of 5 Cinder Kitten Pets! Be sure to vote for my theme, Billiard...I mean...look at all the entries and vote for the best. This week I ended up +55k, not too bad all things considered, but still hovering a bit lower than I want to be, but this is most likely due to not being able to post 3 days this week, and my slacking on posting glyphs. I have been spending a lot on herbs and ore lately, but I have a pretty nice pre-crafted set of items now that should tide me over for a while. I have a supplier, and this weekend when ore prices dropped a bit (1g below average and lots of it) I asked him to cut me even cheaper deal, and he did. Getting about 120 stacks of Ore or herbs a day, at 50-75% of minimum market price, great for business! I got up to date with my glyph crafting this week too, and spread them out so half are on one char, half on another. Liking this setup the best. I'm crafting 6 of each and using macros to switch them in and out of my bank. I'm using something similar to this one from the Consortium, but across 2 toons, crafting all glyphs with profit 30g. The guide is sort of out of date, but should be easily applicable to MoP. These are just some rough numbers of what I made this week, taken from the addon Auditor. It sums up pretty well by character, and I thought a different perspective might be nice. I sold quite a few Darkmoon Cards this week which was surprising because I still have one of each trinket unsold, and the next faire won't be for 10 days or so. I've been dominating the gem market and buying Living Steel CDs because it's profitable for me to do so. Realizing lately that my website is pretty jumbled as far as using it to find useful information, going to try and consolidate any lists I have and links to relevant data some time in the near future. Haven't had a whole lot of time in the last week or so to be particularly active because of work, but I'm on it in general. If you have anything you'd like to see be sure to let me know, and I'll consider it! Professions - do you have all of them, some or none? Which is your favorite for goldmaking? I decided to add a page to my site with My Personal Profession Destribution. The TL;DR for the max level professions is this: 4 Xmute Alchemists, 3 Scribes, 1 Tailor, 1 Enchanter, 1 JC, 1 Engineer, 1 BS (not at 90 yet), and an Herbalist/Miner. I'd have to go with Alchemy for this. The daily transmute is clutch, and the ability (with my miner) to make Ghost Iron Ore into Trillium Bars is great. Just to me if you have a small amount of time to invest, and don't want to spend a ton of time making gold in WoW, pick up Alchemy. If you have more time to devote to gold making, pick up JC, and an Enchater as well. Now you have the deadly combo. Tailoring/BS/LW are all great in their own right, but all require level 90 to truely benefit from, which isn't a reality for all players. According to TSM I should be up roughly 93k this week, but I'm only up about 34k this week. This is because I've been buying a ton of GIO from a supplier, which isn't recorded in TSM. People ask if I ever make gold with transmog, as if I love reposting hundreds of items every 48 hours, paying literally hundreds of gold in AH fees in the end just to lose gold. I wonder if people think before they ask these kinds of questions. Logic! On the Alliance side of things, a potential transmog buyer sent me a mail saying that I should sell them an item for about 5% what I had it listed for, because it was only worth that. Now here's the thing, if you want to say hey I only have x gold and I like that item, what do you think of making a deal? Okay, that's fine, I'll consider it. But telling me I don't know how to price an item is not the way into my heart. I relisted the item at twice the price, and they have kept pestering me. The thing that bothers me the most is that it's for transmog, and there are literally 12 identical models, some rewards from quests, some drops from low level dungeon bosses, so there is no reason to really buy it if you did ~1 minute of research on Wowhead. Oh well. With all the surplus GIO I have I've been doing a lot of prospecting, bar making (which is nice because it's AFK time), and transmuting. It's actually perfect timing with 5.2 on the horizon, it will be nice to not have to craft daily when it drops. As I've mentioned elsewhere what I'm doing right now for gems (rare) is cutting 20 of each cut that sells, and posting on 12 hr auctions, so I don't need to cancel really ever, which is nice. A big chunk of my income this week was from DMF cards, but I've yet to sell a single trinket. If they do sell I will indeed be crafting more for 5.2, but if they do not, I will probably skip out on making decks during the next DMF and just stick to the cards. I've got a good ~100k in trinkets that haven't moved yet, but they have a good 3 weeks before doomsday. I also made a lot of gem sales. I noticed that on my server (relatively small) that after Sha runs there's a big boost in gem and enchant purchases, so if you see a run advertising in trade, post when the advertisements stop, and you're sure to hook a few extra sales! This is for Day 14 of Nev's 20 Days of Goldmaking. Interested in reading other's views on the topics? Nev made a post with all the participants here. Check it out, there's some really great posts! How much of your playtime is devoted to gold making? Do you raid/pvp/pet battle too or is the AH your main playtime? Gold making is my priority in WoW. It's what I enjoy most, so I always go through my routine before enjoying other aspects of the game. I log all of my alts, do their cooldowns, and cancel/repost auctions. After that I'll log on my main, and do their ritual. Since my main is my only 90, I only have one Halfhill farm where I can get GL from, so I check the BMAH, maintain my farm at halfhill, and do my tailoring CD while sitting in a queue. Since my main is a mage, my queues tend to be long, so why not profit while waiting? Right now it's the holiday queue, but usually I for a dungeon or raid. 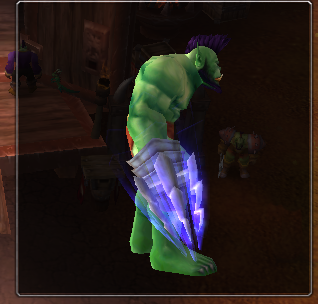 After sitting in my queue, possibly having it pop, I continue with doing the Dominance Point dailies (Horde). I got a late start on this faction, but I've really enjoyed playing through them, and I make sure to do them every day. These are really the only dailies that I do, even though I don't have most reps maxed yet. I just don't care for the other ones given my profession spread. I suppose I should try and get the Tailoring 28 slot bag pattern just in case it's becomes the best thing for me to do with my Tailoring CD, but to me the grind is just not worth it! I was into PvP pretty heavily for a few seasons, but then my RBG and 3v3 teams fell apart, and I just didn't have the motivation to grind out the gear again. I'm quite interested in the changes being made to PvP in 5.2 and I might take a stab at it. As for the Battle Pets, I do indeed have a team of full 25s. I really enjoyed battle pets for a few weeks, but it got awfully repetitive, and I haven't really been active with it for quite some time now. I do enjoy having the level 25 pets so I can learn and transfer some 25 pets between servers to move some gold! As of late though, this process hasn't been going too well for me, but I'm not losing anything on my main server, and have a plethora of 25 pets now! For a TL;DR version, I'd say about 60% of my play time is dedicated to gold making, with the rest dedicated to PvE activities. How much of your play time do you spend making gold? This is for Day 13 of Nev's 20 Days of Goldmaking. Interested in reading other's views on the topics? Nev made a post with all the participants here. Check it out, there's some really great stuff! About 6 months ago I was able to buy two TCG mounts off the AH for 75k and 80k. If my memory serves me correctly (not sure if it does) I first saw them on The Undermine Journal's Great Deals page. I did some research and the average sell price was 150k, so I made the 155k investment. If you look, you'll be able to recognize this on the first major drop on my Gold Totals page. Yikes, 155k in the hole was an uncomfortable feeling. I listed them for 150k each on a 48 hour auction, no bites. Ouch. Not even a single whisper or mail looking for a deal I got worried. Listed them both again at 150 for a 48 hour auction in the morning. That night both had sold, and I had 285k in my mailbox! Up 130k profit from two flips, needless to say, that was a BIG yay moment for me, I doubt I'll see a flip like that again for a very long time, but it was very exciting! How about you? What was your biggest 'Yay!' moment in gold making? Today you're in for a treat, my first guest post on Phat Lewts' Gold Blog! Hopefully the first of many! Today's post comes to you from a writer named Profitz. Profitz has recently set out on a new server with the aim of making 1 million gold, and is chronicling his journey on his blog, Wow's Profitz. Be sure to check it out for other great posts! Without further ado, "Perfectly Purchased Perfection". Recently, I've been spending a lot of time reviewing the statistics on The Undermine Journal (TUJ). I'm sure you have it bookmarked already but if you don't, I would book mark this one right now. Not only can you find pretty decent deals (Great Deals) but you can track your own auctions, check undercuts, current market value across all professions, see a break down of what you're selling in categories, what over top-sellers are moving, trending data, and more. What I found most interesting today is its ability to capture and graphically report market-value on existing gems (whether uncut, perfect, epic) by color. This makes is easier to know what could potentially sell on the AH with your Jewelcrafter instead of mindlessly burning through cuts without understanding their sell points. This gets refreshed every hour like the statistics do. Obviously this is all point-in-time and doesn't last over time so frequent visits to see what's hot is important. Have you bookmarked it yet? Check this it out - even with color coding to help you identify what's selling/cost quicker. An excerpt from TUJ explains the colors: "A blue background indicates that gem is selling under 75% of the price of the uncut gem. A yellow background indicates a gem selling for 1.5 times over the uncut price, and the red background indicates a gem selling for 3 times the price of its uncut counterpart." If you liked this post from Profitz you can find more on his blog. In another of his recent posts, Fabulous Flipping Fun, he goes over his recent success in the 80-85 Rares market, another great read. I've also added him to my blogroll on the left sidebar! Hey guys, today I'm going to bring you an older gold making tip that I myself just recently decided to (finally) dive into, and highly recommend. I've really been enjoying the benefits from this one the past week already, and figured I'd pass it on. Meet Nomi. TL;DR Nomi gives you free gold every day. If you've already maxed out your cooking in all fields, hopefully you already have heard about the Ironpaw Exchange, exchanging raw cooking mats for Ironpaw tokens from Nam Ironpaw. Conveniently, The Undermine Journal has calculated the minimum cost for one token via this exchange under Gathered -> Cooking (scroll down to Ironpaw Token Trades). This does not ensure there will be the quantity you need on the AH, but does tell you the cheapest current method. Alternatively you could also do the dailies (50 days is too long for me!). With 5.2 on the PTR, a new raid patch is coming Soon™. What better way to profit from all the raiders than by food given to you for free from a tiny panda? Don't forget to use those Ironpaw Tokens for Soy Sauce/Rice Flour/Black Pepper! As you can see, although I had about 110k worth of income this week, I spent almost 80k. It's not a bad week, I will make it up with the cards for the next few weeks. With all the 5.2 buzz going around and talk of people stockpiling, I'm in the skeptic camp to say the very least. Everyone and their grandma has a stockpile going right now, which means there will not be an overwhelming demand come 5.2 release (weeks from now still). In fact on my server this week, a player has been attempting (fairly successfully) to reset the Ghost Iron Ore market. I'm on a small server and when I say small, I mean bots don't bother farming on this server because they've done the calculations and don't want to waste their time. Our ore market is controlled by those who actually go out and farm, and there's quite a few of them. Someone on my server has recently seen this as an opportunity. GIO usually hovers around 100g/stack on my server, and I aim to buy in bulk at 60g/stack. This player has been buying everything on the AH and resetting the price to 200g/stack. According to a reliable miner on my server, they are actually selling at this price. Who would buy at such a price point is beyond me, but in theory if you sold half your product then the rest is free GIO that you didn't have to farm for, to do with as you please. I have taken it into my own hands (as it has now become inconvenient for me) to start stockpiling some GIO just to use to deeply undercut them. Right now I'm undercutting 200 stacks at 160g on a 48 hour auction, and I actually sold 20 stacks at that price! I'm hoping to drive this person out of the market because it's really messing with my profit margins, and it's unappreciated. I have an ore source, but like I said it's a limited commodity on my server, and my source just doesn't supply enough for me to consume. Hopefully this plays out in my favor in the long run. This week was pretty stale, made gold from the standards, gems, glyphs, trinkets, PvP gear, etc, etc. I've been taking time away from gold making to work on my gear, and do the Dominance Point dailies, which I have been enjoying to my surprise. Got the legendary gem, but have no weapon to socket it in (after 6 runs). Hopefully this week will bring me some luck! Well that's about it for now, I leave you with this question: What would you do if you were in my shoes with the GIO situation? This is for Day 11 of Nev's 20 Days. More posts by other great writers on these topics can be found here. Most of us use TSM, Auctioneer and/or Auctionator in combo with Postal - are there any other lesser known gold making addons you use? My "base" addons consist of all the TSM modules and Auctionator. These are my directly related to the AH addons, and honestly I could live without every addon I use other than TSM. I use Auctionator occasionally, but I could do everything with TSM and be fine. Auctionator is just still a little faster on certain things. I use TSM_Mailing to deal with my mail, so I actually don't use Postal anymore. I'm just going to make a list of the addons I use and why I use them, they'll be ranked by the order I'd suggest them. iSold - I think you'll have to enable out of date addons for this one, but this addon makes a ka-ching cash register noise every time you make a sale. Stay on your glyph poster for a minute or two after you post and soak in all the glory! Mogit - (Shown Below) This is a great addon for transmog purposes, whether they be for gold making or not. It shows you what an item looks like when you mouseover it in the AH, and it also has a database where you can find an item by color! If you don't use it, it comes highly recommended! Auditor - (Shown Below) Again another "out of date" addon, but one that adds up your gold total on a realm with little resource consumption. Altoholic can do the same, but this one keeps running totals of your gold, and although I have both I prefer the hover over to see gold totals feature of this one. Gathermate 2.0 - If you insist on gathering, fishing, or like to know where Dark Soil or Onyx Eggs are for rep, this is the addon for you. You can also subscribe to my livestream channel on twitch.tv to see when I'm streaming!